In sizes 12-18 months all the way to 14, this boxer brief pattern is sewn with knit fabrics and a hidden elastic waistband. The pattern can be sewn with or without a fly opening in all sizes. Instructions are also included for turning your boxer briefs into trainers. 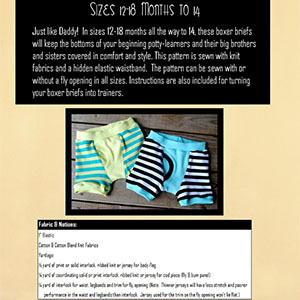 Sizes 12 months to 14T.